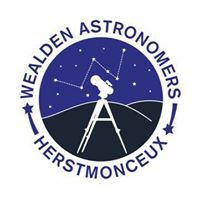 A small astronomical group based at Herstmonceux Village Hall, Hailsham Road, Herstmonceux BN27 4JX (in conjunction with STEM Sussex) to promote astronomy. As a reminder the next society meeting is this Sat at the Science Centre. Our revised arrival time is 19:15 for a 19:45 start as there is a twilight booking in before us. Please do not arrive before this time, as the Centre staff will need time to clear up at the end of the event. All comments are moderated, so there will be a short delay before your post will appear on the site. If you do not use any of the login profiles listed, please choose Anonymous and include you name in the comment box. Copyright © Wealden Astronomical Society (2014-2016) All rights reserved.. Picture Window theme. Theme images by sololos. Powered by Blogger.